MRIS released its data for August signed sales contracts for existing home and condos in the District last Thursday. 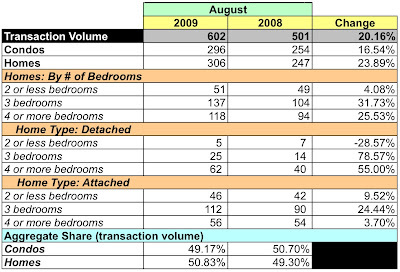 As in its July report, sales and dollar volume are up and prices are lower than the same period last year. However, August's data were slightly weaker than July's. Where it was positive, it was not as positive. Overall dollar volume was flat, ticking upwards a slight 0.59%. Compared to July, Ausgust was a more temperate month for condos, with a 7.58% upward movement. Homes were down by 3.7%. Sales volume was good, increasing 20.16% YoY, but, again, not as strong as July. 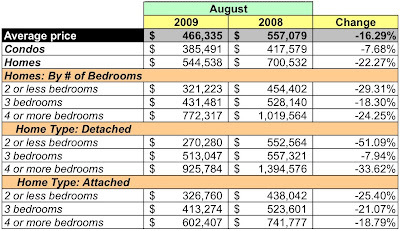 Condos and homes both shared in the positive growth, increasing 16.54% and 23.89%, respectively. Prices told a sad tale, each metric almost exactly matching July's performance. Average prices fell 16.29%. Condo prices fell 7.68%, while home prices tanked, dropping 22.27%. Not a single home category experienced higher prices in August. At July's sales rate, there is a 4.92 month's supply of condo units on the market, 6.64% less than July. For homes, 5.51 months, 7.29% more. It's good for the overall market to see that the sales volume increased--hopefully it means sellers are more realistic about their asking price. The September stats are going to be interesting though.